Whether you are looking to prevent bed bugs from bugging you at night, or just wanting to waterproof your bed, before you shopping for a mattress encasement, it is important that you know why you are buying it in the first place. The main reason why you need to go for the best mattress encasement is because you already spent a lot of money purchasing a quality mattress, you need to protect it to give it more durability and protect the warrant as well. These covers are going to keep your mattress clean, and give it that new feel for a long time. And as an added bonus, some of the covers we review are bed bug proof, preventing any dust mite allergies from acting up. After you have spent a fortune purchasing a quality mattress, the next best thing to do is make sure that it is taken care of. After all, you wouldn’t like to replace a mattress on a yearly basis. If you get the high-quality encasement for your mattress, then you are sorted. 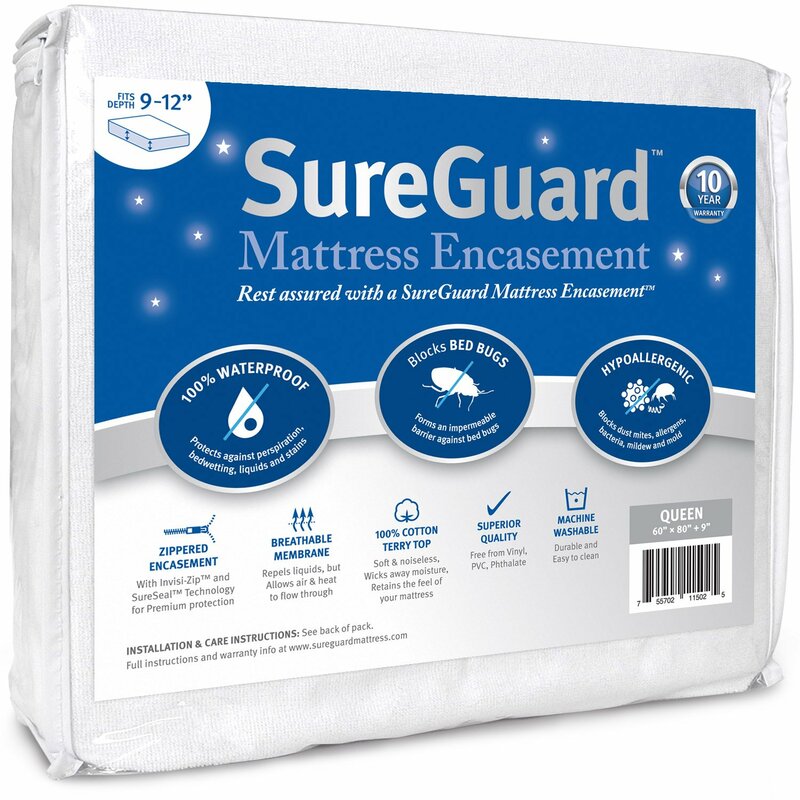 Sureguard Mattress Encasement is one I can easily recommend because I have experience of using it and I found it to have high quality and at the same time, good value for money. It kept my mattress safe from allergens and water damage. It is made from cotton terry material, which is soft and undetectable when you sleep on it. It is available in sheet format and comes with an expandable skirt. Maintaining the cleanliness is very easy as it is machine washable and then you can tumble dry using low heat or even air to dry. Avoid dry cleaning, ironing or bleaching it as it will be spoilt. If you happen to purchase on Amazon, it comes with 30 days to try risk-free. It passed the waterproof test I subjected it to. My mattress is a 10-inch and it fits perfectly well. When I slept on it, I didn’t feel it on the sheet due to the terry cotton material which goes undetectable. 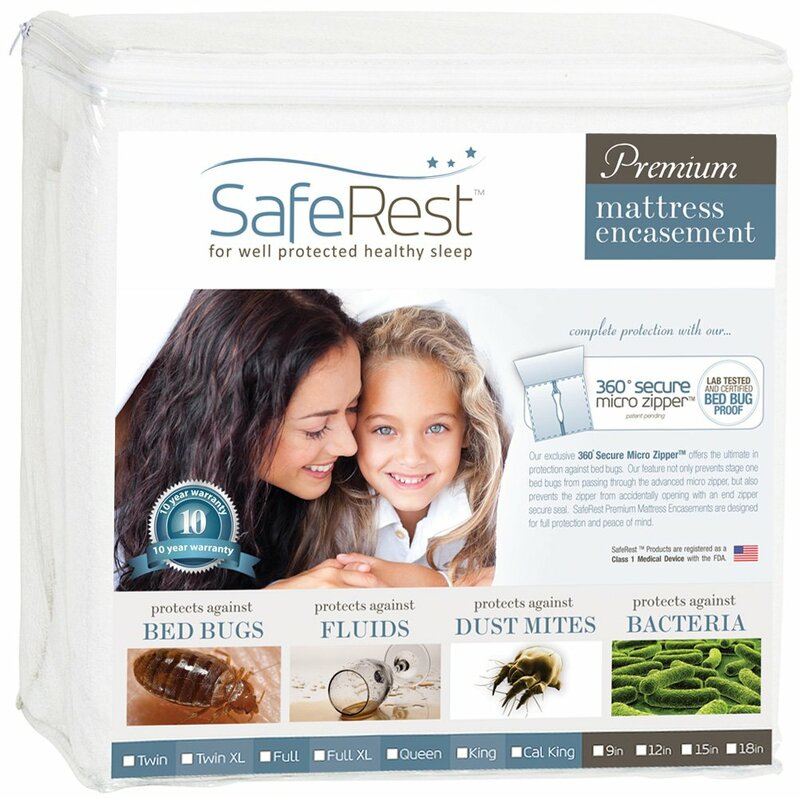 Zippered Mattress Encasement by SafeRest is more than just an overlay protector. It gives the mattress a full coverage of all the six sizes and it is more than just waterproofing too. My cousin bought this and he told me that, it is independently certified to proof even against the bed bugs in all its stages. He told me that, it comes with a 10-year warranty which could imply that, it is a high-quality cover for the mattress which you could consider purchasing. In their warrant, Saferest has a full replacement clause and thus, in case you find any problem with the mattress, you can readily return it to the manufacturer for a replacement. It is made from cotton terry material, which is breathable. I am one person who cannot withstand a dirty mattress, and if you are like me, then am sure you are looking for a mattress cover to make it possible for you to maintain the cleanliness. Nobody enjoys sleeping on dead skin cells, dust mites, and other allergens. It will also protect your bed against bugs, stains, and at the same time, extend the lifespan of your mattress as it protects your warrant. 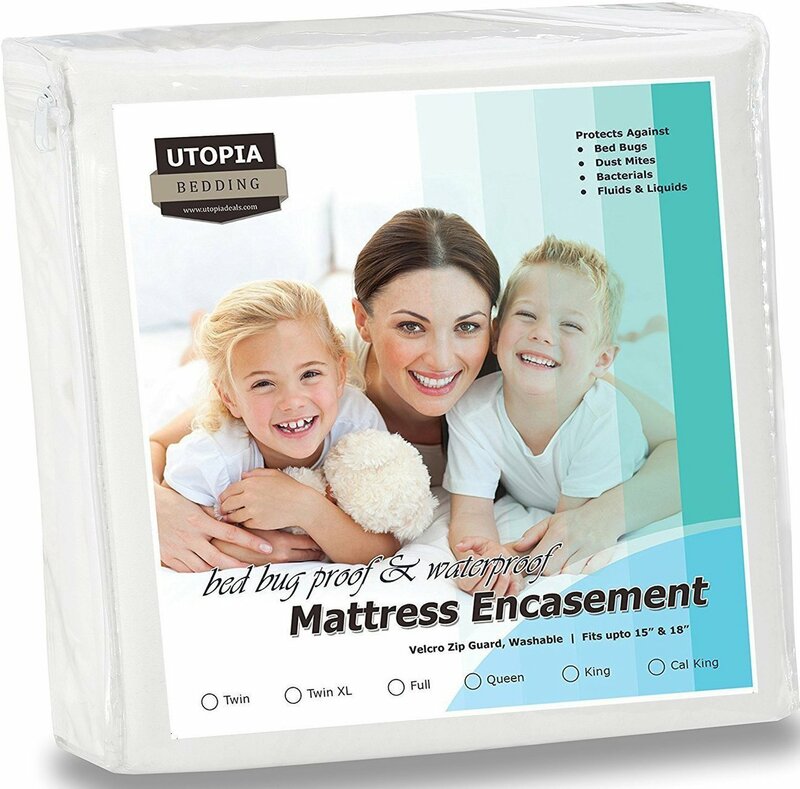 Using Zippered Mattress Encasement by Utopia will completely encase your mattress, as it comes in a well-knitted polyester fabric which will completely fit your bed the way a sheet does. Apart from protecting your mattress from the wear and tear, dust mites and bugs will be no more. It is capable of covering up to 15 inches deep mattresses. If you are looking for an encasement to protect your mattress from spills and bed bugs, then this could do it very well. It is also good for those suffering from asthma. My nephew is asthmatic and the mother had a rough time getting the right fit for him in terms of a cover to keep the mattress clean as well as to avoid it reacting with his condition. He settled for this particular one and for the last one year, it has served them well. In case you don’t like feeling noises as you rotate on your bed, then avoid this particular encasement as it makes some mild noise any time you turn. When you turn on the bed, it makes some mild noise and thus not good for those who are sensitive to noise. It is the ultimate in a fluid, bed bug, dust mite, and allergy protection. 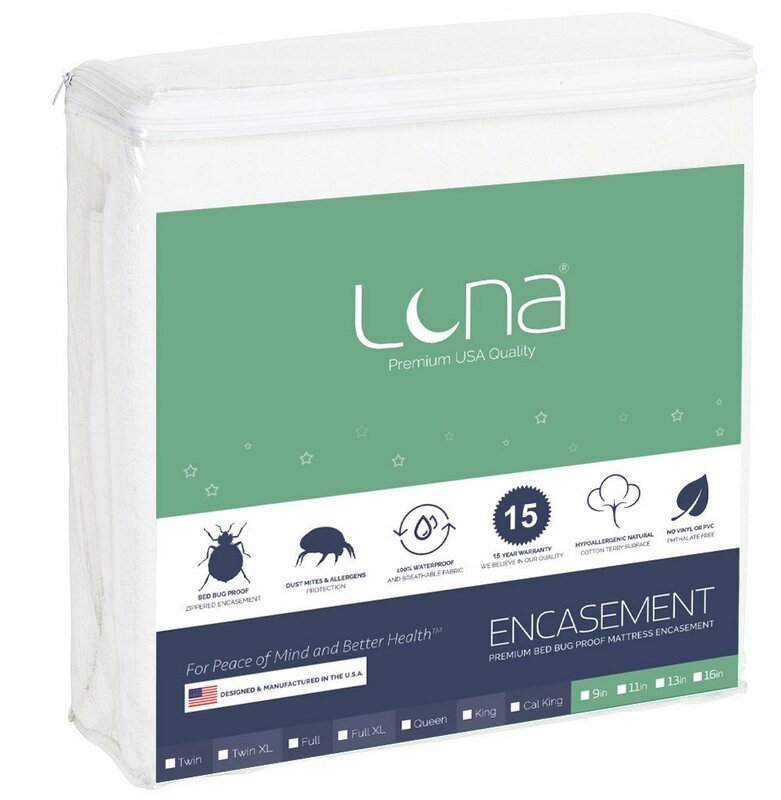 I was having a problem with bedbugs whenever I visited my grandma’s place, last December when I visited, I decided to buy for her the Luna Premium hypoallergenic zippered bed bug proof, and believe it or not, not a single red spot from bed bug bites the following morning. It comes with a all the sides bed bug proofed which fully seals off the encasement. The mattress is completely surrounded on all the six sides, preventing any penetration of dust mites, bed bugs, fungus and bacteria from entering. Even though it is encased, it still allows the mattress to remain breathable due to the presence of the Luna Airflow Technology which helps in preventing sweating and heat build up. Remember, apart from being a nuisance during your sleep time, bed bugs can cause so many health issues. This particular mattress encasement will enable you to treat and at the same time, prevent bed bug infestations of your mattress. Its airflow technology enables air to flow through as it repels away any moisture. You will be offered with protection against bacteria, bed bugs, liquid spills, and dust mites. The place where the zipper meets the materials doesn’t seem as if there is protection from dust mites and bed bugs…poor finishing. 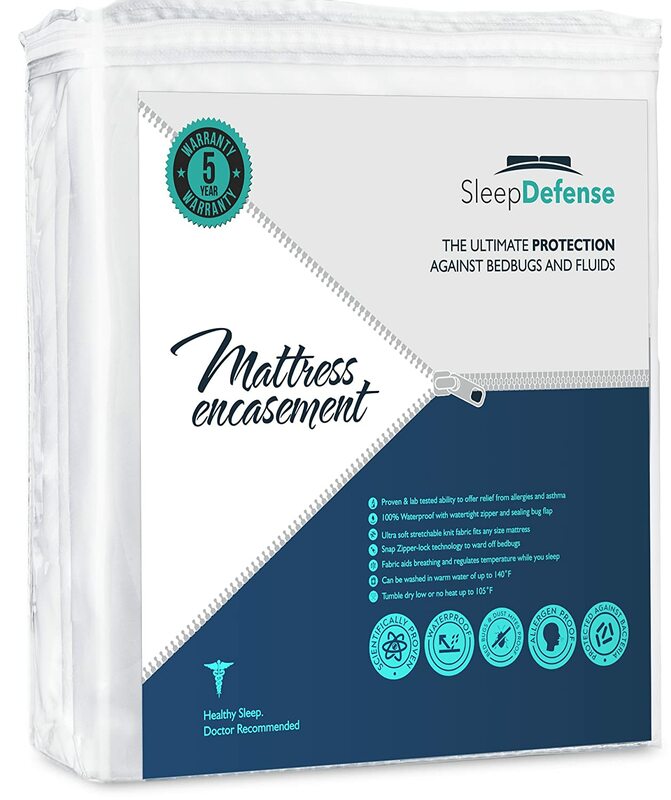 The sleep Defense Premium queen mattress encasement which is bed bug proof will keep away the bed bugs from invading your mattress and your home as well. From an informed viewpoint, this could be encasement for you as it is made of tough seam construction and thus, it is very hard for anything to come out or go inside it. It is made from polyester knit fabric which has a high thread count and thus, your bed will feel comfortable while at the same time, it will offer you with protection of the highest order. It is a waterproof encasement and thus, in case of any spills on your bed, all you need to do is soak it with a rag without leaking through, and there will be no need to remove the cover. Remember that, the protector is only capable of handling small spills which you will need to take away immediately. Apart from blocking bed bugs, the encasement is also capable of relieving those who have asthma and other respiratory issues. A colleague of mine attested to this fact. He is asthmatic and since he started using this particular encasement, he rarely uses his inhaler and attacks are no more. I think due to the fact that it prevents bacteria, dust mites and other allergens from reaching him, that could be the mystery behind it. There is also an allergy blocker which helps in preventing any allergens from escaping through the zipper. It comes with a strong zipper on all the three sides and also has a zipper lock and bug flap which ensures that the encasement remains bug proof as you use. Body heat is not trapped in due to the fact that it is fully breathable. 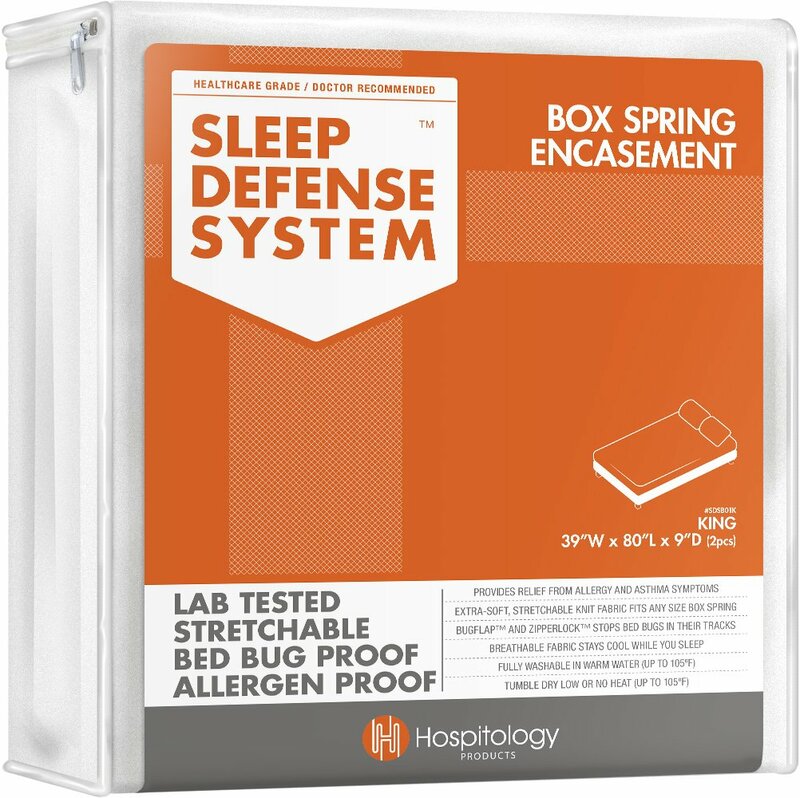 Sleep defense system premium zippered bed bug mattress encasement provides protection on all the six sides of the mattress. When you sleep on it, its material feels smooth under the sheet and at the same time, noiseless. I bought it for my mum during the random tests I was doing for the mattress encasement and she loved its feel. To her, it was a great buy to protect her Queen-size Foam Mattress. She feels that it is shielding her mattress perfectly well while protecting it from dust mites, allergens, bed bugs, spills and bed wetting from her grannies when they come visiting. It is 100 percent bed bug proof and also good in easing respiratory allergens and symptoms. It is capable of fitting all sizes of mattresses as it is zippered and can also stretch. It can help to ease respiratory problems such as asthma as it will block the allergens while you are sleeping. Made from the quality polyester knit material, making it cool and comfortable. 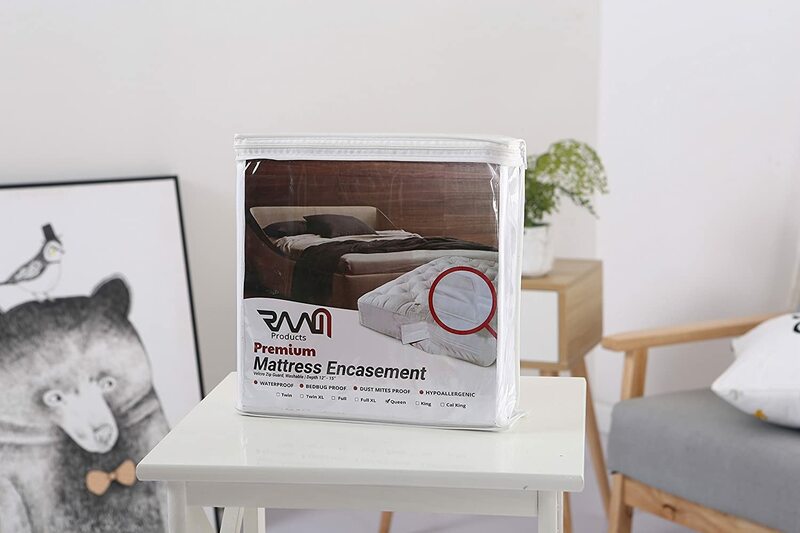 Raam Premium mattress encasement could be considered one of the best mattress encasement available in the market and which your money can buy. It is capable of holding seniors or child bed wetting. If every morning you wake up with strange bites on your body, it might be that your mattress is infested with bed bugs or dust mites. Using this particular encasement might just be the solution to your problem. My grandpa has a bladder problem and thus, when asleep, at times he ends up bed wetting. I decided to buy for him this particular encasement and it is doing the job perfectly well. 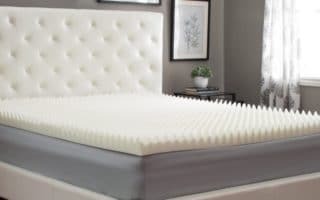 I can say that it has proven to be 100% hypoallergenic (remembering that he is also asthmatic and it hasn’t affected him in any way), all the six sides of the mattress are protected and you will not suffer from dust mites or bed bug bites. It is made of 20 percent polyester and 80 percent cotton, interlocking knitting laminated with 0.02 TPU to make it noiseless. It is one encasement which doesn’t trap heat. High-quality polyester and cotton material has been used. It is good for bed bugs and dust mites as it protects the mattress on all the six sides. It has a Velcro closure for the zipper. What Constitute The High-Quality Encasement for Your Mattress? A mattress encasement is totally different from your normal bed sheet. A bed sheet refers to a thin fabric which can be used to keep the bed clean and fresh. This is not enough for you and your mattress and that is why you require a mattress encasement. If you get one that is quality, it will do more than just covering your mattress. It will keep bed bugs out, protect your mattress from dust mites and being waterproof, protect your mattress from spills. When you are buying a mattress encasement specifically for bed bugs, then you will need to, first of all, know if you are faced with the problem of bed bug infestation or not. So how do you ensure that you have a bed bug problem before you commit your money to buy an encasement? You will need to look under fitted sheets along the edges of the mattress, inspect the box spring while paying close attention to the four corners under the guard. In the box spring, look keenly where the dust cover is. If there are no bed bugs, then go to the next step. After inspecting your sleeping area and upholstered furniture and finding out that there are no bed bugs, you will need to install an interception device or active monitor. This will help you to intercept any bed bugs before they get to their breeding places. After every 2 to 4 weeks, you will need to check them out to find out if there are any trapped in the monitor. Use an active monitor that uses carbon dioxide and other chemicals to detect and lure the bugs if there are any. It is more expensive than the interception devices. You will then need to install an encasement once you are sure that, there are no bed bugs which are already in your mattress. It will help you to keep those bags which already are therein, and those which are trying to get in, no space to penetrate. Most of them are normally zipper secure with ends that have flaps and thus, even the smallest of the bugs will be kept outside of the mattress. So if you think you already have a bug infestation, you can call a professional to clean it first using the pest control method, before you can install your mattress encasement. But you can still go for a mattress cover which is effective enough to keep them in. Though pest control is expensive, it is the most effective way to keep the bugs away. It is capable of detecting infestation at its lowest and kill them before they breed more. Apart from the problem of bed bugs, the mattress encasement is capable of ensuring that the mattress is free from dust mites which are normally responsible for very many health problems. If when you sleep on your mattress it gives you allergies, then you are better off purchasing a mattress encasement that is hypoallergenic. This will enable the allergens to be kept off the mattress. In order to be healthy, you need a good night sleep so that, when you wake up in the morning, you need to have been well rested in order to be productive. Fresh and clean beddings are among the things which contribute to the comfort you can get on your mattress. If you invest in a quality mattress encasement, you will be in a position to maintain the cleanliness. Mattress encasement being waterproof means that, fluids like wet hair or saliva which could in the long run damage your mattress, are going to be a thing of the past. Spills from water and maybe bed wetting can also cause damage to your mattress. Getting a waterproof mattress encasement will ensure that your mattress remains clean and dry. Instead of enlisting the services of professional mattress cleaners, which are normally expensive, you are better using an encasement for your mattress. When you decide that you are ready to invest in a quality mattress encasement, you will find a variety on the market. Try visiting your local store and you will be shocked at how many you get there because they are available in different brands. Check out online and you will be spoilt for choice and thus, you need to know what exactly you are looking for in your particular mattress encasement before you step out, to avoid being confused. Here are some of the basic features which you need to consider before committing your money to buy an encasement for your mattress. It is important to check out how durable your encasement is going to be so that, you see if it is good value for your money. You can check reviews online for those who already used the particular encasement you want to buy and see if they were happy customers or not. The material used can also tell you if the mattress is durable or not and also if the workmanship is top notch or not. Get one that has a warranty because, at least, you are sure that, if it doesn’t meet your expectation, you can exchange it for something better. The higher the warrant, the most likely the high quality of the product. Most of the encasement for mattress come with 360-degree zipper enclosures, making it easy to remove and install. Look for one where you will do it on your own without having to use the help of someone else when installing and when removing to wash. They are available in different sizes and thus, depending on your mattress size, you will go for the one that is most suitable. Mine is a king size and I got a variety of that particular size. You can get them in Twin, Twin XL, Full, Queen, King and California King. After knowing what size your mattress is, you will need to check the thickness of your mattress. While there is that encasement which can stretch to fit whatever thickness, I would recommend that you know your mattress thickness so that you buy one that is best suitable. You don’t have to go buy an encasement for a 12-inch thick mattress and yet your mattress is 18 inches. Go for a mattress encasement which is 100 percent waterproof. It is also good if you can check out to find what type of zipper it has to know if it will be in a position to keep your mattress secure or not. If it is a top-notch zipper, you are sure that, the dust mites and bed bugs will be kept aloof. If you suffer from allergies, then go for one that is made with hypoallergenic materials. Every product, no matter how good it is, has its own pros and cons. Check out the pros and cons of the mattress encasements and make sure that, you go for that with more pros and fewer cons. As you can see from the above, you will be spoilt for choice when you go out there to purchase your mattress encasement. Let this be a guide to enable you to buy the right one for your needs so that, at the end of the day, you will feel that, you have good value for your money. Next ArticleThe 8 Most Common Mattress Types – Which option is best you? Best Mattress Vacuum Cleaners – Don’t let the bed bugs bite!